Your home is one of your biggest investments, and when it comes time to sell it, you want to get as much out of it as you can. You can use a real estate agent to sell your home, or you can do it yourself. Selling a home is hard work, which is why most people hire a Realtor or real estate agent to handle the job for them. However, if you are willing to put the effort in yourself, you can avoid losing a percentage of your home’s selling price on your realtor’s commission. Real estate agents take as much as 7 percent of the sale price from a home, some of which you can retain yourself, if you take on the task of selling your home independently. Below, learn everything you need to know about successfully selling your home without the help of a real estate agent. Advertising your house through various means, such as by producing flyers, brochures and ads. Making sure your house is filed with the Multiple Listing Service (MLS). Showing your property to prospective buyers and renters and holding open houses. Working with the buyers to negotiate prices and other closing details. Once you know what real estate agents do, it is easier to list your home as “for sale by owner” (FSBO). With an entrepreneurial spirit and a little hard work, you can find just as much success as a FSBO seller as you would by hiring an agent to do the job for you. The first step in selling your home successfully is to set a fair price for it. Many FSBO sellers make the mistake of overestimating the value of their homes, which leads to a more challenging task ahead. It can be hard to set an appropriate price for your own home, especially when you have sentimental feelings toward it. To determine a fair price for your home, consider its square footage, how old it is, how many bedrooms you have and where your home is located. There are a variety of online calculators that let you enter these variables to see what a fair asking price may be for your home. In addition to using home value tools and calculators, be sure to check real estate websites to see what comparable homes in the area have sold for in recent months. When comparing homes, focus on those with similar square footage and other features. When you do not trust yourself to make a fair assessment after taking these steps, you may want to consider hiring an appraiser. While there is some cost associated with having your home appraised, you will have more peace of mind knowing that your efforts will not be wasted by setting the price too high or low. Finally, be sure to use high-quality photos in any advertisements you create. Consider hiring a professional if you are unable to get good photos on your own, as buyers can easily be turned away by unattractive picture. To fully market your home, you must list it online, as the vast majority of buyers start their search on the internet. 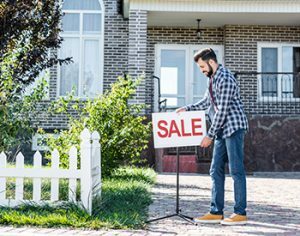 After all, you can’t expect a large number of potential buyers to simply drive past your home and call after they see your “for sale” sign. There are countless avenues for advertising your home online. While some, such as Craigslist, are free, it is worth the cost to place a paid listing on reputable real estate websites. Many websites are tailored to FSBO sellers, and some even offer advertising services on other avenues such as the Multiple Listing Service (MLS) that real estate brokers use. You can expect to pay between $100 and $400 for a one-year listing on most real-estate websites. No one is going to buy a house sight unseen, which means you must be prepared to show your house once it is on the market. One way to get started is to hold an open house event just as a realtor would. To ensure the most success with an open house, be sure you advertise it ahead of time and provide light refreshments. Before an open house and before you show your home to anyone individually, it is crucial that you clean thoroughly. Staging your house as professionally as possible is always a good idea. Consider stashing away personal items such as photographs and keepsakes so that potential buyers can picture themselves in your home better. Even though you may endeavor to sell your home alone, chances are that most people interested in your house will be using a real estate agent. The buyer’s agent traditionally splits the commission from the home sale with the seller’s agent. Since you, the seller, will be working as your own agent, you may need to work out an agreement with buyers’ agents who you interact with. If buyers’ agents assume that they will not get a commission from working with you, it is possible that fewer agents will be interested in showing your home to their clients. To increase your chances of success, you may want to offer an incentive that will keep buyers’ agents interested. Because a buyer’s agent is accustomed to getting about half of the commission, which is about 3 percent, you can attract more agents by upholding this offer just as any other seller’s agent traditionally would. In any case, it is crucial to check your state’s laws to see what regulations may apply when making a deal with a buyer’s agent.